Share your important message quickly with the US Weight ChainBoss and Sentry sign kit. The sign holder perfectly fits on top of your US Weight ChainBoss or Sentry stanchion and allows you to advertise wherever temporary or permanent signage is needed. This sign holder is not compatible with other stanchions. Promote specials or instruct consumer traffic through your queue using the plastic frame with a visual area of 8-inch x 10-inch. The frame accepts 8.5-inch x 11-inch documents and features a Plexiglass cover to keep your sign protected and supported. 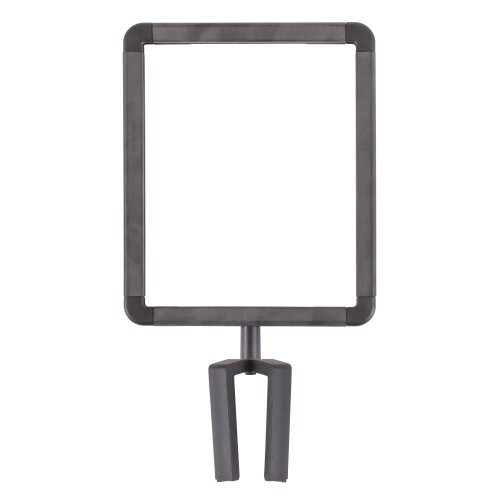 Create your own messages and easily change them out as you desire with the US Weight ChainBoss and Sentry Sign Holder.